Electrical engineer Wentai Liu has been working on an artificial retina to restore vision to the blind for 20 years. Photo by Jim MacKenzie. Last year, Wentai Liu watched as surgeons implanted a microchip he had designed into the eye of a blind patient. For Liu, a professor of electrical engineering in the Baskin School of Engineering at the University of California, Santa Cruz, it was a major milestone in two decades of work on an artificial retina to restore vision to the blind. Ten patients are now enrolled in a clinical trial of the device based on Liu's microchip at four leading ophthalmic centers in the United States. Patients are also enrolled in trials in Mexico, Switzerland, France, and the United Kingdom. Developed through a large collaborative effort involving biomedical researchers nationwide, the retinal prosthesis is an implantable electronic device intended for patients blinded by diseases such as retinitis pigmentosa and age-related macular degeneration. These diseases destroy the light receptors in the retina, but not the nerve fibers that connect the eye to the brain. The implanted microchip stimulates the neurons in the retina, relaying visual signals that are transmitted to the chip from a tiny video camera integrated into a pair of sunglasses. "This chip is very different from those seen in typical electronics because it is implanted in the body and directly interfaces with a human organ. There is very little margin for error in such a system," Liu said. The chip is a core component of the Argus II Retinal Prosthesis System, produced by Second Sight Medical Products, the commercial partner of the Artificial Retina Project funded by the U.S. Department of Energy (DOE) Office of Science. Liu's work on the chip was funded by the National Science Foundation (NSF) and later by DOE for further developments. 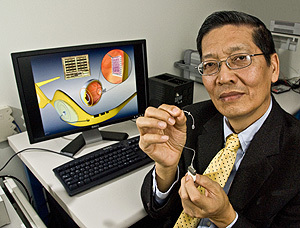 Liu's pioneering work on the retinal prosthesis began in 1988, when he teamed up with Dr. Mark Humayun, an ophthalmologist and bioengineer now at the University of Southern California. The DOE Artificial Retina consortium now coordinating the project involves three universities, six national laboratories, and a private company (Second Sight). A first-generation device (Argus 16, also from Second Sight) delivered electrical impulses through an array of 16 electrodes attached to the retina. It was tested on six patients with retinitis pigmentosa between 2002 and 2004, giving them the ability to see patterns of light and dark, perceive motion, count discrete items, and locate and differentiate large objects in their environment. The second-generation Argus II features an array of 60 electrodes and other technological refinements. And Liu is already working on a third-generation device. Although the Argus 16 delivered only 16 "pixels" of visual information, the remarkable plasticity of the human brain enabled patients to make sense of the signals from the implant and derive meaningful, if quite limited, perceptions of their environment. The Argus II is expected to provide patients with a rudimentary form of sight, better than the earlier version, yet still short of the ultimate goal. The dream that Liu and his collaborators are working toward is an implant that enables patients to move independently, recognize faces, and read large print. The implanted electronic chip that drives the Argus II is a highly sophisticated system that balances size, power, and safety requirements to enable an electrical interface with the retina. Wireless transmission of power and data between the implant and the external video system eliminates any need for wires penetrating the skin, which would raise the risk of infections. The implant is about one-fourth the size of the first-generation device, while providing nearly four times as many electrodes to stimulate the retinal neurons. "The development of this chip was a great challenge, but one that is fulfilling when you see the life-changing benefit it can have. I am proud of our work," Liu said, adding that the success of the project owes much to the foresight of agencies such as NSF, DOE, and the National Institutes of Health, which provided long-term funding for it. The three-year clinical trial of the Argus II is the only long-term study of a retinal prosthesis currently under way anywhere in the world. Ten subjects have been recruited for Phase I of the trial at four leading ophthalmic centers in the United States. According to Second Sight, although it is too early to comment on the clinical data, each device continues to function as expected, and all participants are using their systems at home daily. Liu's group is now designing the microelectronics and wireless link for the next-generation implants, which will be even smaller and more sophisticated, with more electrodes interfacing with the retina to provide higher resolution. "Minimizing the size and power requirements of the implanted device, optimizing power delivery, and managing reliable communication and data transmission between implanted and external components are the major challenges," Liu said. Note to reporters: You may contact Liu at wentai@soe.ucsc.edu.